My work is inspired by the ‘edge of the rainbow’. The blurred place where reality and our emotions and imagination mingle. It’s the place that transcends what we see and creates those tiny moments that capture the heart and touch our souls. I am a mainly abstract artist, working on a large scale. I am trying to create fully autonomous paintings that evoke an emotional response in the viewer. I often start with a word, feeling or passage of text and try to visualise those emotions in colour, form and scale. Although some areas of the canvas may resemble water, clouds or sky, I try very hard to remove all reference to reality and hope that a viewer can respond to the paintings as unique objects in their own right. 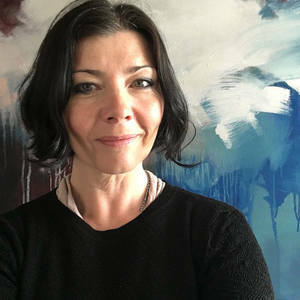 Abigail is represented by Hicks Gallery in Wimbeldon, was born in Brighton and graduated in Fine Art (Painting) from Chelsea College of Art in 1996. Foundation Course in Art & Design from Brighton College of Arts and Technology. The Other Art Fair - London, March 2019. The Other Art Fair - London, October 2018. Artwave - Sussex, August 2018. Hicks Gallery - London, Summer Exhibition 2018. The Other Art Fair - London, 22nd to 25th March 2018. Chalk Gallery, Lewes - 29th Jan to 25th Feb 2018. Lane House Arts, Bath - 29th Sept to 30th Nov 2017. The Other Art Fair - Bristol, 1st to 3rd September 2017. This Is Who We Are (group show) - Bailey Contemporary, Brighton. June 15th to 9th July 2017. Annual Open Exhibition - Pelham House, Lewes. Jan and Feb 2017. Wintertide (group show) - Brush Gallery, Brighton. Dec 2016. Art at The Claremont (group show) - The Claremont Hotel, Hove. Nov 2016 to April 2017. SNUG Christmas Open House (group show) - SNUG Gallery, Hove. Dec 2016. This Shimmering Space - Mange Tout, Brighton. Oct to Nov 2016. Brush (group show) - Brush Gallery, Brighton. March 2016. SNUG Christmas Open House (group show) - SNUG Gallery, Hove. Dec 2015. SNUG May Festival Open House (group show) - SNUG Gallery, Hove. May 2015.